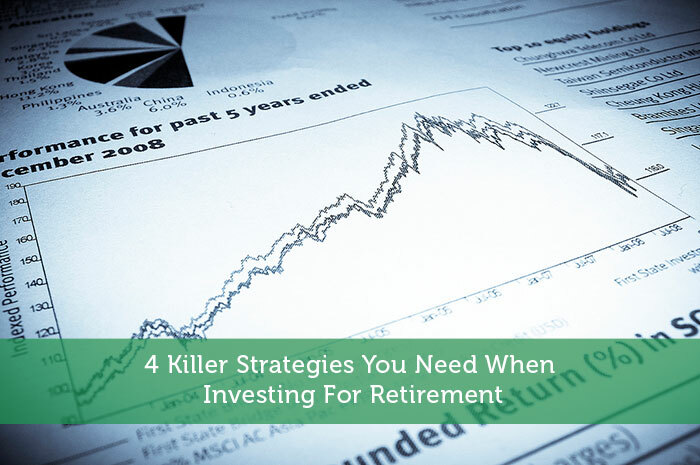 If you have researched investment options for retirement, you’ve certainly noticed the dozens of different strategies and ideologies touted by investment professionals. Too many confusing options and competing interests might be one of the reasons you are procrastinating on the issue. Unfortunately, the number of financial firms and advisers vying for your business will not be decreasing any time in the future, so how should you proceed? As they say in sports – stick to the fundamentals! As you build and grow your investment portfolio for retirement, stick to these underlying principles and successful strategies. Any basic discussion of great investing principles will likely include a quote from Warren Buffett, who states “Be fearful when others are greedy and greedy when others are fearful.” When investing in any security, it is critical that you weigh the risk versus reward. While you need to be careful not to catch a falling knife (i.e. a company on the way to bankruptcy), generally speaking, your risk is minimized significantly when you buy a quality asset or company at a discounted price. Because the market is partially driven by emotional behavior, it tends to overshoot, both to the upside and downside. For instance, when negative news comes out, the market overreacts and oversells. Opportunities like this are ripe for aggressive investing. Nevertheless, any discussion of risk vs. reward needs to be accompanied by vigilant and continuous management of that risk. Because most investments with higher returns usually assume the undertaking of greater risk, it is important to diversify that risk and balance the ratio to avoid complete and unrecoverable losses. If you don’t have a financial advisor to help you, complete an online broker comparison to find the best robo-advisor. People in different financial situations and stages of life have different investment needs and goals. A senior citizen or someone close to retirement does not need to be 100% invested in equities. Their goal is likely to continue to grow their portfolio but also focus on preserving the wealth they’ve created. For this reason, an advisor would likely recommend a 50/50 split between equities and fixed income securities. On the other hand, an investor who is part of the Millennial generation isn’t likely to be retiring in the next decade and can afford to take bigger risks. Since equities are generally more prone to swings in value, both positively and negatively, young investors can be 100% invested in equities to take advantage of the greater appreciation earned in the long-run. One of the biggest mistakes most new investors make is underestimating the damage fees and trading costs can cause a portfolio. Management expenses, commissions, and advisory fees can cause your total return to trail the market, especially when some mutual funds charge the fees upfront. These front-loaded mutual funds often charge an average 5% upfront, meaning that, if you invest $5,000 in the mutual fund, the fund takes $250 as an “entry fee” and you start with $4,750 worth of units. While fund managers with high fees claim their active management of the fund warrants their premiums because they “beat the market”, research shows that an overwhelming majority fail to do so. Instead, most honest financial advisors or investment professionals will tell you that you are better off investing in a low-cost, passively-managed index fund. Similarly, a robo-advisor like Betterment or WealthFront might be a good fit by balancing sophisticated asset management tools with cheap commissions. No doubt you’ve heard the power of compounding interest, so you’ve decided to invest in the stock market for the long run. However, many amateur investors also hope to be able to time the market, sell at highs, buy back at lows, and continue to ride the wave higher. Unfortunately, these investors are no better at timing the market than active fund managers and hedge funds. In fact, studies show that a few select days actually account for a majority of the stock market’s gains. The chart below from JPMorgan Asset Management illustrates that having been fully invested in the S&P 500 from 1993 to 2013 would have yielded a 9.2% annualized return. If you will recall, this period actually includes the Dot Com Boom and Bust, the largest terrorist attack on America soil, the financial crisis and years of the Great Recession afterwards. 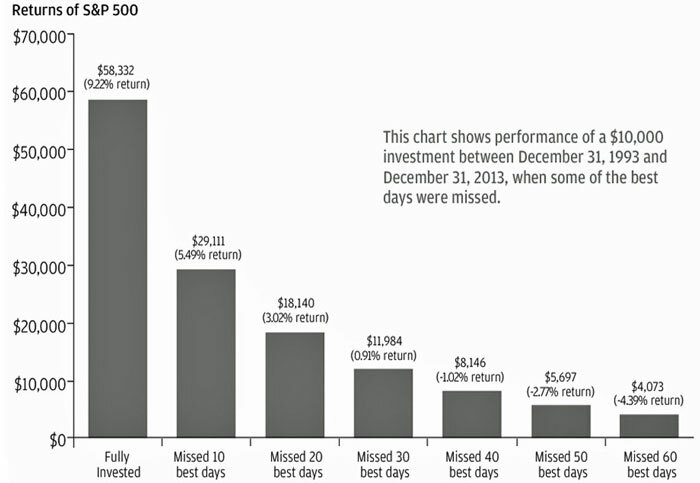 More importantly, the chart also demonstrates that by missing only ten trading days out of 10 years, an investor’s returns can be cut nearly in half. While the markets fluctuate, and investors experience negative returns some days or even years, historically, the good has far outweighed the bad, so invest for the long-term and stay in the market. There is no secret to saving and investing for retirement. It is simply a life-long commitment that requires the execution of basic investment principles – manage and diversify risk, minimize costs, and stay invested. Author Bio: Gary Dek and John Schmoll are the founders of Best Discount Brokerages, a website dedicated to reviewing and recommending the best discount brokers online. As two former investment professionals, their goal is to simplify the process of saving and investing for retirement. When I started investing in my retirement, I really answered lots of questions and assessed my capability to check whether I could manage to meet my goals and ways to increase my income.